Nearly every visitor to Venice sees it—and most snap a picture of it—yet barely a handful ever bother taking the quick vaporetto ride over to visit the church of San Giorgio Maggiore. 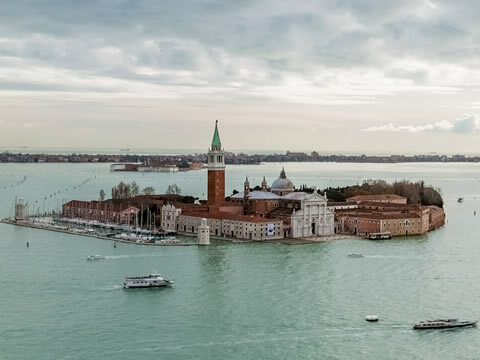 This is a shame, since they're missing not only one of the architectural glories of Venice, but one that is decorated with works by Tintoretto, Carpaccio, and Jacopo Bassano and that boasts spectacular views from the bell tower. San Giorgio's Palladio-designed gleaming white facade and lithe brick-and-marble bell tower seem almost to float in the middle of the Bacino San Marco (St. Mark's Basin), supported on its own tiny island (for getting there, see below) just a few hundred yards off St. Mark's Square. This island was long known as the Isle of Cypresses, occupied since at least the 10th century by an order of Benedictine monks. The monastery was rebuilt in the 13th century after an earthquake, acquired the Palladian church of San Giorgio Maggiore in the 16th century, and became a renowned center of learning, frequently hosting visiting scholars and other eminent visitors—in 1433, Cosimo de Medici lived here during his exile from Florence. Napoléon suppressed the monastery in 1797 and plundered its riches, after which the island floundered for a few centuries, serving as a free port after 1829, then an artillery headquarters after 1851. In 1951, Count Vittorio Cini purchased the whole place for his Cini Foundation (www.cini.it), restored it and its library, and it once again became a cultural center hosting international scholars, occasional events and exhibits, and performances in a small open-air Greek-style theater. Adoration of the Shepherds (1591) by Jacopo Bassano. 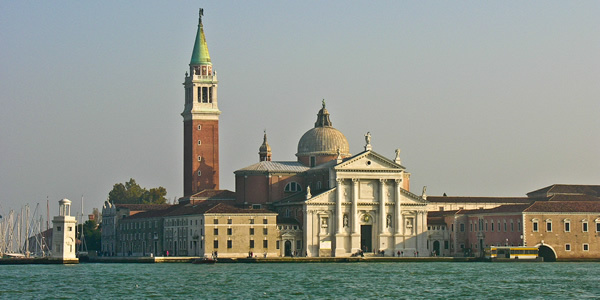 Construction on the church of San Giorgio began in 1566 on a plan by Andrea Palladio, greatest of the High Renaissance architects interpreting the Neoclassical ideal. His "Palladian" theories and style would go on to influence everyone from Christopher Wren in London to Thomas Jefferson in America—which is why Jefferson's Monticello and the major buildings and monuments of Washington, DC look the way they do. For San Giorgio Maggiore, Palladio used an innovative split-level, two-tiered layered facade with a pair of stacked pediments—and a portico inspired by Greek pronaos—with side windows modeled on those in Roman baths (helping make it one of the few light-infused churches in Venice). 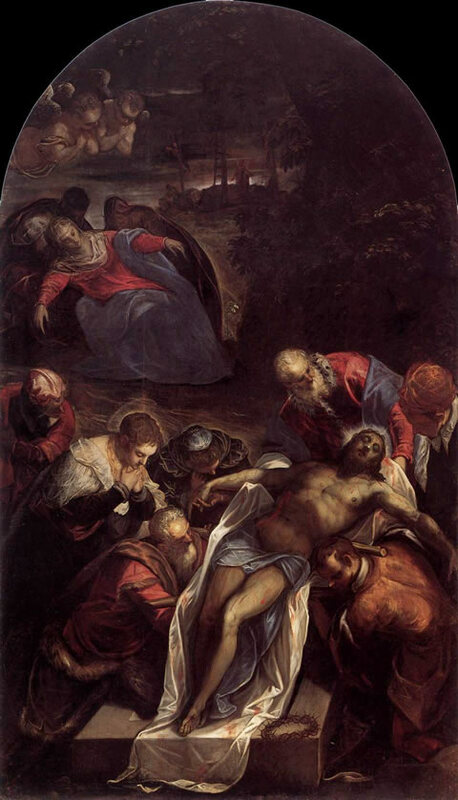 Deposition or Entombment (1594) by Jacopo Tintoretto. 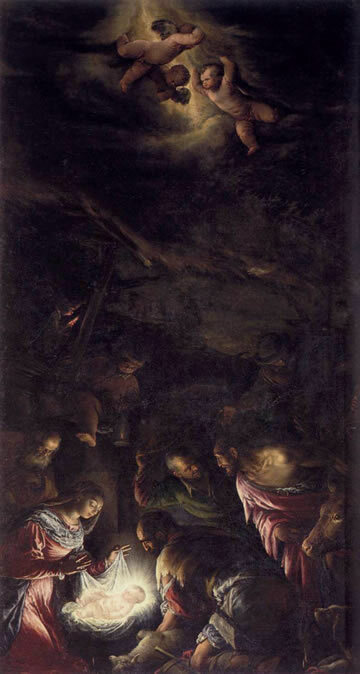 This light helps illuminate the works of art decorating the spare interior of white Istrian stone, including the long, dark Adoration of the Shepherds (first altar on the right) by Jacopo Bassano (a.k.a. Jacopo da Ponte). In the deep choir are some fine Tintoretto canvases, including Shower of Manna from Heaven on the left, and a dark and brooding The Last Supper (pictured below) on the right (both 1594). In a chilling series of coincidences, Tintoretto's final painting—probably left unfinished upon his death and completed by his son Domenico—is a Deposition (1592–94) that now resides in the church's Chapel of the Dead. 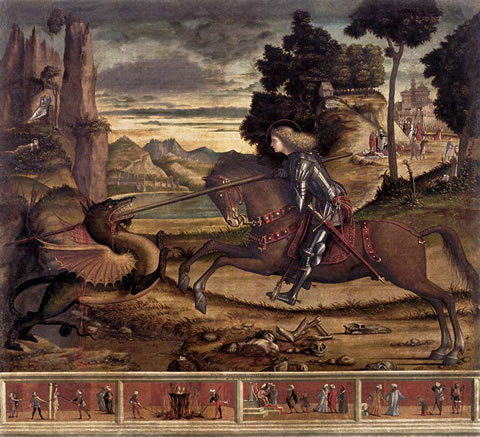 St. George and the Dragon (1516) by Vittore Carpaccio. The reason the choir, with its 16th century stalls, was designed to be so deep is two-fold. 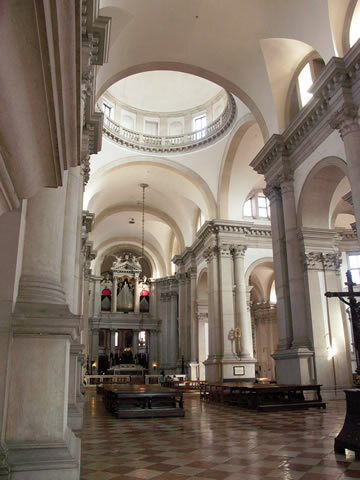 Firstly, Palladio was trying to balance the Latin Cross ideal with the classic basilican plan—which is also the reason the dome has been placed equidistant from both the altar and the entrance. Secondly, it was tradition for the Doge to come to San Giorgio to hear St. Stephen's Mass (December 26, traditionally a bigger holiday in Italy than even Christmas the day before), which for the occasion was sung by a double choir consisting of the resident Benedictine monks and the A-squad of St. Mark's choristers. To the right of the choir, a door leads to the so-called Conclave Room (see the sidebar below) with an altarpiece of St. George and the Dragon (1516) by the first great Venetian Old Master, Vittore Carpaccio. Sadly, this room is usually closed to the public. Pope Pius VII (1805) by Jacque-Louis David (this painting hangs in the Louvre in Paris). Since the great Western Schism ended in 1417, every papal conclave has been held in Rome (usually in the Sistine Chapel) except one. While Napoléon's troops were occupying the Eternal City in 1799–1800, the college of cardinals met in Venice, at San Giorgio, to elect a new pope after nearly four months of stalemates. 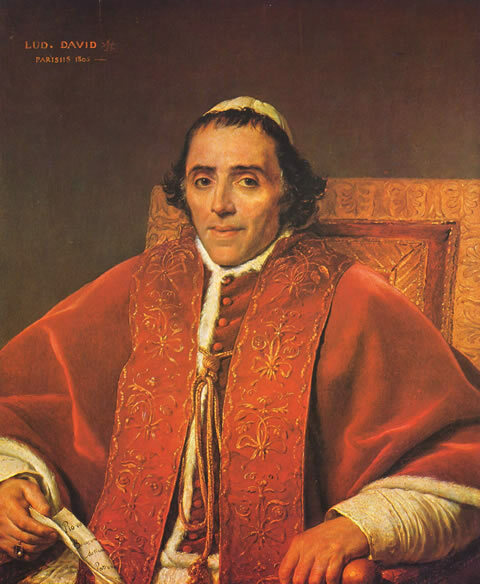 On March 21, 1800, they settled on a compromise and elevated Count Barnaba Niccolò Maria Luigi Chiaramonti to Pope Pius VII. He ended up reigning for more than 23 years. 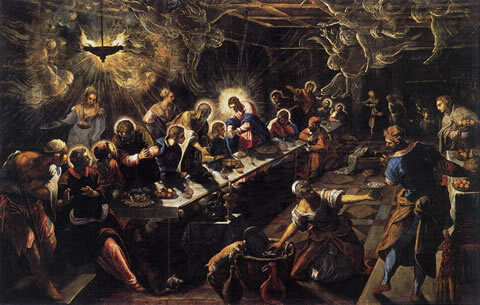 The Last Supper (1594) by Jacopo Tintoretto. One thing Palladio doesn't get credit for is the campanile (bell tower), which was designed in 1726 by Scalfarotto (rebuilt in 1791 by Buratti) in the style of the nearby one in St. Mark's Square. Just like that far more famous cousin, this campanile offers spectacular views over the city—and across the Adriatic and, on clear days, as far as the Alps—and just like the one on Piazza San Marco, it even has an elevator to the top (unusual in Italy). What sets this campanile (and its views) apart from the Campanile di San Marco are the fact that there are no long lines to get in, no crowds at the top (heck, usually you're up there all alone), it costs almost half the price to go up there, and its view includes a full-on postcard shot of Piazza San Marco just across the waters (when you're up on that other bell tower, you can't get it, itself in the picture). This is why my recommendation for vista-hungry Venice visitors is to... well, climb both bell towers, actually. The views are both totally different and totally worth it. Sorry. I just can't resist a great panorama (or a tower to climb; in fact, I'm one of those weirdos who prefers the stairs). However, when you climb this one, you'll feel like you're getting some kind of secret, private experience rather than the typical tourist jostle. The elevator up the the top of its campanile (bell tower) only costs €5 (compared to €8 at St. Mark's across the way), and the views are arguably better and more sweeping, as you're smack in the center of the bacino (bay)—plus: no long waits in line or jostling with crowds at the top. How long does San Giorgio take? How do I get to San Giorgio Maggiore? 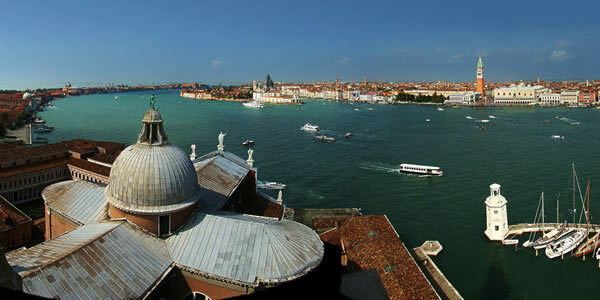 To get to San Giorgio Maggiore, hop the no. 2 vaporetto at the S. Zaccaria stop for the 3-minute ride across. Upon leaving the church, be sure you board a vaporetto headed the other direction to get back to S. Zaccaria—unless you want to continue on the Giudecca, perhaps on a Palladian tour to visit also Il Redentore. Mass (in Gregorian chant) is held Sundays at 11am. This article was written by Reid Bramblett and was last updated in July 2013 .